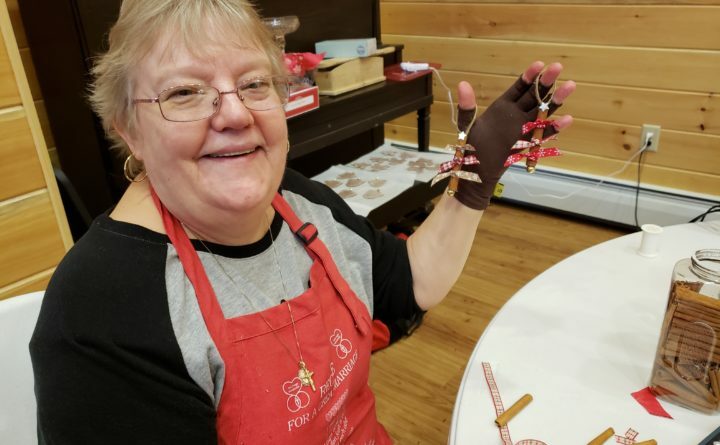 Darla Phillips, a U.S. Army veteran from Troy, made Christmas ornaments earlier this month at a women veteran's crafting and hobby retreat at the House in the Woods in Troy. Last October, U.S. Marine Corps veteran Anne Devin was invited to take part in a bird hunting trip for women veterans. The hunting was fine, but it was the camaraderie that was really special. She found herself wanting to spend less time in the field looking for birds and more time talking and doing handiwork with the other veterans. “All I wanted to do was sit on the couch and learn how to knit,” she said. That’s when the 51-year-old farmer from Monroe had an idea. Why not create a retreat for women veterans that would let them do just that? During the first weekend in November, despite howling winds and driving rain, that’s exactly what happened. Women veterans from four branches of the armed services gathered at the House in the Woods in Lee to crochet, knit, sew, make ornaments and make cards together. In the process, they talked, laughed and cried, with some finding that the time helped them to heal some invisible wounds, too. One of the women who jumped at the chance to attend the retreat at the House in the Woods was Darla Phillips of Troy, who enlisted in the U.S. Army out of high school and spent 20 years serving before she retired. In Lee, she knitted and made Christmas ornaments, but mostly just relished the time spent with the other women. Phillips is proud she served the country and feels that her years in the Army helped her have a good work ethic, to always do her best and to take responsibility for her own actions. But there is another side to her military experience, too. The women she met in Lee all knew, even if they served in different branches and at different times. Some had deployed and served overseas. Some had not. But their similarities were greater than their differences. “We all signed that paycheck offering our lives to our country,” Phillips said. They also endured trials that male veterans perhaps did not. She did not experience sexual assault. “I was very fortunate in that,” she said. But she did experience pervasive sexism and sexual harassment. That’s not surprising, according to a major 1995 study from the Department of Defense, which found that rates of sexual harassment and victimization among active duty populations to be 78 percent for women and 38 percent for men. Rates of military sexual trauma among veteran users of VA health care also were high, with nearly a quarter of women users of VA health care reporting at least one sexual assault while in the military. Even 15 years after she joined the military, it continued. About three months after she had joined a new unit, she found out the commander had secretly talked to the other men about her. “‘She’s a woman. She’s weak. Get rid of her,’” he told them. But they didn’t. When she asked them why, the men told her that things had gotten better in their unit after she came along, and they wanted her to stay. The lodge in Lee where the retreat was held is a special place that came to life after a tragedy. In 2007, the small town lost two young men in Iraq: U.S. Army Sgt. Joel A. House and Sgt. Blair Emery, who served with the military police. House’s parents, Paul and Dee House, founded the nonprofit organization after spending time with military families who were experiencing the same grief and loss as they were. The program they started offers outdoor recreational activities to active military members, veterans and their families so that they can relax and deal with stress, loss, grief and other difficult emotions together. Even so, one attendee, Lisa Montgomery of Milford grappled with anxiety caused by post-traumatic stress disorder before she could actually get in her car and go. The 40-year-old Penobscot Indian had joined the Air Force when she was 22, a young woman excited about her new career path. But that excitement changed to fear and stress when she was sexually assaulted by a senior non-commissioned officer. “I never reported it. I was in fuels, a male-dominated career field, and I knew there was no way I was going to bring this up,” she said. Eventually, she got out of the military, a decision that also caused her distress. “I grieved for a long time that I gave up my career. I feel I would have served 20 years if that had not happened,” she said. After leaving the Air Force in 2004, Montgomery, who had just gotten divorced, came home to Maine with her young child. For nearly a decade, she threw herself into motherhood and education, getting her bachelor’s degree and then going to graduate school. She pushed the sexual assault and trauma toward the back of her mind, not wanting to think about it or deal with it. But it was there all the same. About six years ago, Montgomery’s physical and mental health began to fray. She was beset by post-traumatic stress disorder that stemmed from the sexual assault and its attendant anxiety, depression and suicidal thoughts. “I’ve been so in the depths of dark depression,” she said. Finally, she began to climb out of those depths, seeking help through the U.S. Department of Veterans Affairs and other avenues. Thanks to medication, counseling and her ability to advocate to get services, she has started to feel better. So when she heard about the women veteran’s crafting weekend, she was interested. “I wanted to have a weekend where I could just give myself permission to relax,” Montgomery said. She decided to go, but nearly canceled at the last minute. The idea of leaving her house and spending the weekend with other people was almost too much to bear. Still, she made it up to the House in the Woods, telling herself that she didn’t have to stay if she didn’t want to and making sure to pack native herbs, including ceremonial woman’s tobacco, to help with her insomnia. Once she was there, she realized she was exactly where she needed to be.